In this VBA Tutorial we'll explain how debug your code. Debugging is running your code step by step from where you decide. Open an new Excel WorkSheet (or Word document) and press F11 to open the VBA Editor. Right click on any blank space among the toolbars. Click on Debug. The Debug menu bar will display. If it displays as a floating bar and not as a fixed toolbar, drag it into the toolbar area. Do the same for the Edit menu. 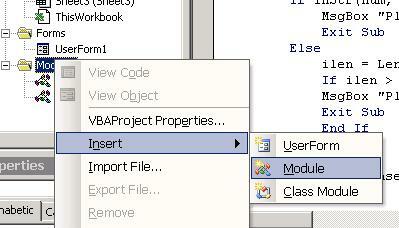 Right click on any branch in the VBAProject Explorer tree and click Insert > Module. Copy the following code and Paste it in the Module. MsgBox "Please enter an integer with 1 to 6 digits." note: there is a much easier way to put a comma in a number using the Format command - this VBA tutorial is about how to debug your code. and click the Comment Block Icon that is the Edit menu we added in step 4. This will place an apostrophe at the beginning of the line. 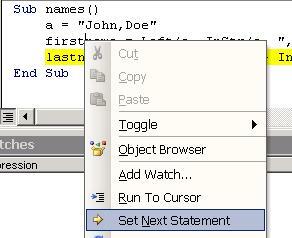 A line that starts with an apostrophe as the first character in the line is considered a Comment by VBA. Since we are going to debug this code in this VBA tutorial, we will assign numbers to a variable instead of popping up an Inputbox. This will save time. After we are sure our code works, we can uncomment the line and Comment or delete the line that assigns a value to the variable. Commented lines appear in green for easy identifiability. At the end of the code also comment out the line MsgBox num. Press F8 or click the Step Into button in the Debug menu we added in Step 3. As you click Step into or press F8 the code will advance line by line according to the logic of your code. In our example we are setting num to 1579 which is an integer with less than 7 digits so we will bypass all the Message Boxes that inform the user to enter an appropriate value. Keep stepping through the code until the last line End Sub is highlighted in yellow. Hover your mouse over the variable iRight3Digits (near the end) and you will see the value it holds. Do this also for the variables iLeftDigits and num. Say you forgot to put the -1 at the end of the firstname line. When you hover the mouse over the variable firstname you would see "John,"
While you are in Debug mode you can change you code to correct this. Then Right click on the line you corrected and click Set Next Statemant. Click on the grey margin to the left of a line. This ends this VBA Tutorial.